The Dexter 43 inch vanity combo offers a combination of styles where country meets contemporary. From its Rustic Gray finish to it striking metal inset, Dexter blends rural and industrial details to create an intriguing cabinet that will be the centrepiece of your bathroom. A solid ash wood frame, soft-close hinges, and simple pulls finished in black bronze complete the look of this unpretentious but beautiful piece of bathroom furniture. The combos includes an integrated dark gray granite stone top. A matching mirror is also available. Dexter defines modern bathroom design. The Emma 43 inch vanity combo embraces purity of design and masterful construction. The vanity in Dove Gray finish paired with brushed nickel hardware brings to life the cabinet's simple, clean lines. Emma provides abundant storage and Zen-like functionality. Soft-close glides and hinges keep things quiet and the solid wood frame and dovetail joints keep things strong. It includes a carrera white marble top and rectangular undermount sink. The collection also features complementary mirror and linen tower to expand the look. Emma makes your bathroom beautiful. The Provence 49 inch vanity combo is offered in a beautiful distressed white wood finish with hand carved French details. This vanity comes with all soft-close doors and drawer glides. Coordinating pieces include matching mirrors and linen tower to complete the look. The vanity combo includes an impala black granite top and undermount sink. 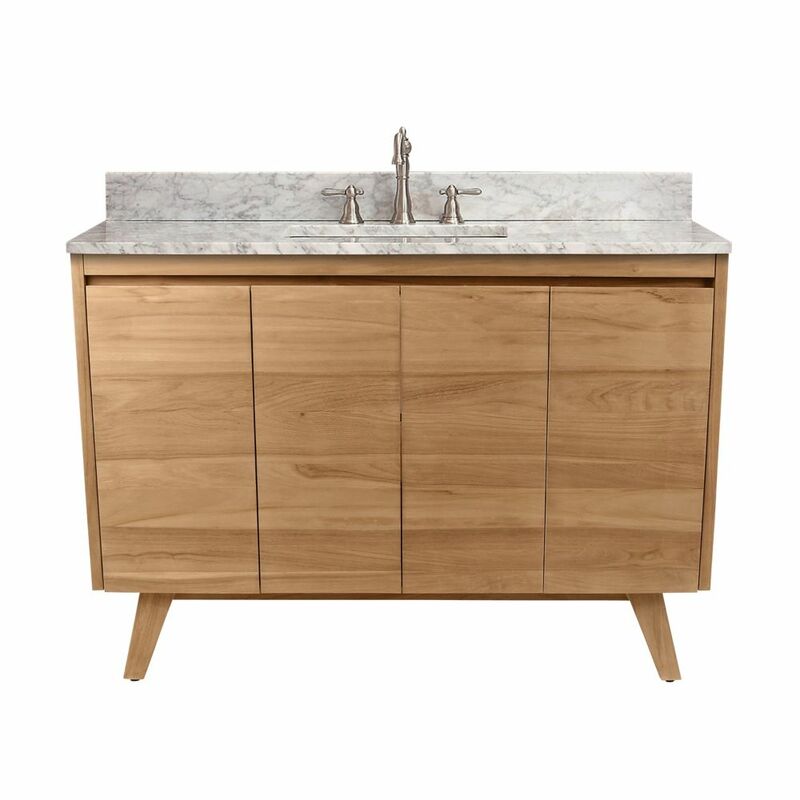 Coventry 49 inch Vanity in Natural Teak with Carrara White Top Inspired by mid-century modern console design, the Coventry Collection from Avanity features solid teak construction with minimal ornamentation. The 49 inch natural teak Coventry features soft-close doors, sturdy and stylish splayed legs, and an abundance of storage space. Teak is the perfect material for bathroom furniture, as it is both durable and water resistant. With Coventry form follows function with superb simplicity. The combo includes a natural Carrera white marble top and undermount rectangular sink. Coventry 49 inch Vanity in Natural Teak with Carrara White Top is rated 4.0 out of 5 by 1. Rated 4 out of 5 by Helene from Read carefully “natural teak” as vanity is not sealed. ... Read carefully “natural teak” as vanity is not sealed. I had my painter apply seal to protect. Granted teak may not need that however at this price point, I wanted to protect the investment. is the carrara marble vanity top sealed? Hi renovator -- Thanks for your interest in the Coventry 49 inch Vanity in Natural Teak with Carrara White Top by Avanity. The top is sealed and will suffice for normal use. However we recommend you might choose to reseal the top if you are very worried about water stains and cannot perform regular maintenance of wiping up spills.